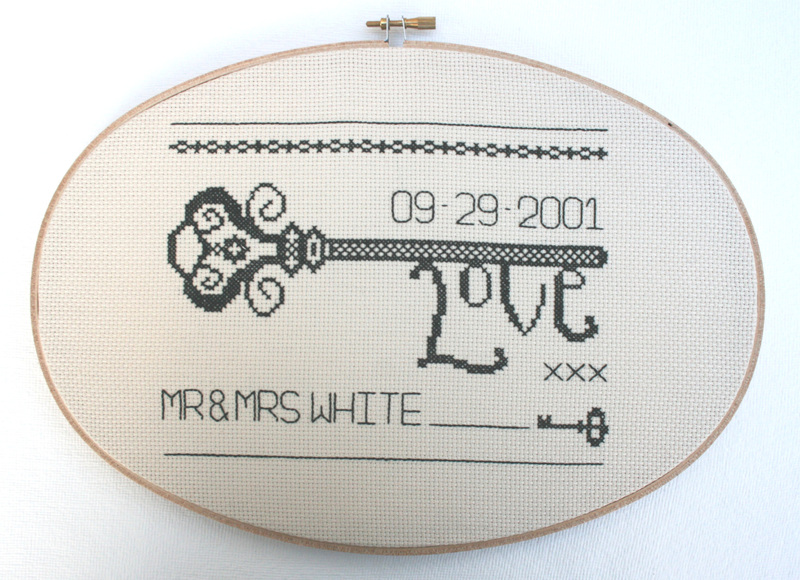 Celebrate your special relationship with this modern, personalised cross stitch sampler cross stitch Kit. This kit makes a fantastic traditional gift either completed or in the kit form. This fresh contemporary, Vintage Key design is inspired by the very beautiful traditional blackwork embroidery and is stitched on to a lovely light hessian cotton Aida. Your kit will contains everything you need to create a truly special keepsake. Use the additional alphabet provided to personalise with the special couples names and special date. Basic cross stitch instruction for those of you that are novices. And alphabet and directions as to how to personalize with the couples name and special date. Once finished stitch area is 20cm wide x 15cm high. It is displayed here in an 8 x12 inch embroidery hoop. Need an embroidery hoop, extra needles or embroidery Scissors? I can help. Visit my Stitch Supply Shop . Delivery: UK Free, Europe £2.90, USA £3.50, Australia £3.90, elsewhere £2.90 - see our delivery page for more details. © StitchKits. For personal use only.